11/12/18: This mod will not harm your game, but please keep in mind that all the mods that I have made patches for have been updated. Some in drastic ways, other in minor. I do not have the time to make additional patches, but I encourage everyone to make their own patches using FNVEdit just as I have. You are free to use these as a base. 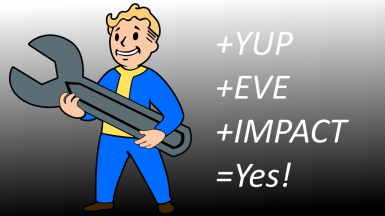 YUP is pretty great, EVE and IMPACT are as well. Why not make them all work together? Three files, each one is a single plugin based on which mods you have, pretty intuitive. The YUP + EVE + IMPACT file also has a few changes that try to merge conflicts between EVE and IMPACT, most notably the Sentrybot weapons. Everything else that conflicts is left alone because IMPACT is supposed to supersede EVE. Place whatever patch you choose lower in your load order than the mods it patches. Please note: these changes utilize the All DLC versions of all three mods so unless you have all the DLC/Ultimate Edition then these patches ain't gonna work for you. Don't have the DLCs? Make your own patch.